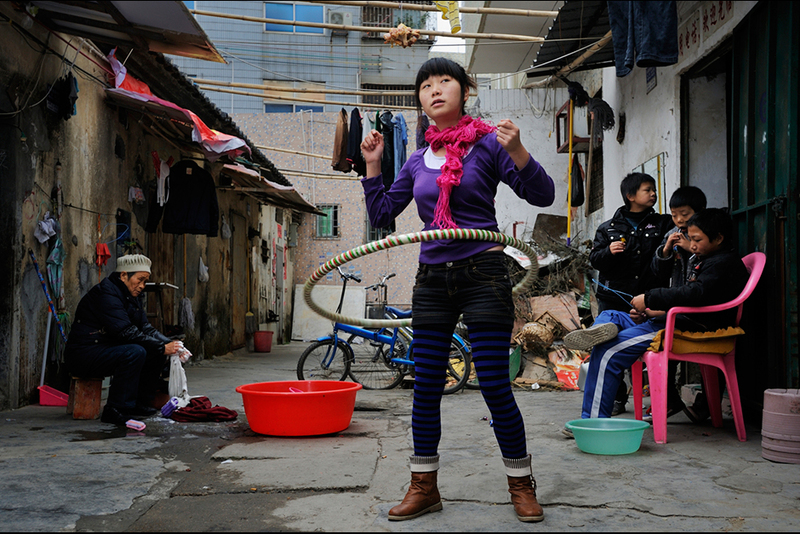 Zhao Meifang’s daughter, Tan Yue, who was working at Freetrend New Balance plant at the time, hula hoops during the 2010 Lunar New Year holiday. Since then she has moved to another shoe factory in Guangdong. 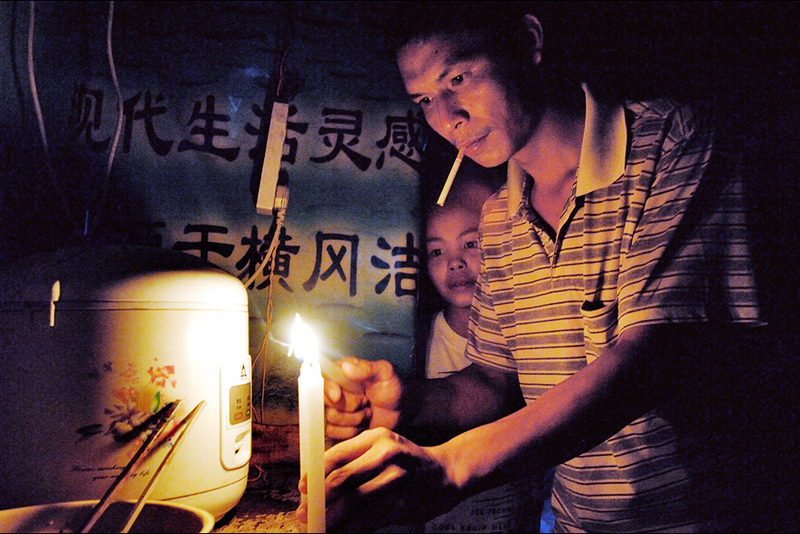 Wuwucun factory worker Xu Huali’s husband, Zhao Xiaoyun, lights candles during one of the rolling blackouts that were common at the time this photograph was made in 2005. Xu Huali, left, moved to Shenzhen from rural Chongqing in 1991 with a grade school education. She eventually moved to Wuwucun in 1999 after marrying another Chongqing migrant. Xu has spent the last decade as a shoemaker. She currently glues soles to uppers for New Balance for 2,000 yuan (about $320) per month, but in 2005, she was earning much less making Reeboks. In this photo, taken on a rare Friday off from work, Xu watches her son, Zhao Neng, being bathed by his grandfather. 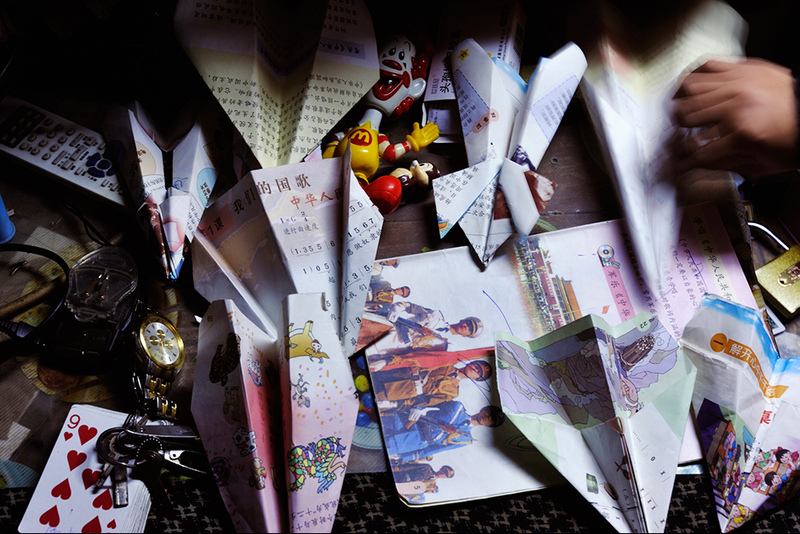 At Zhao Meifang’s house, her kids and nephews use pages from old school books to make paper airplanes. While the workers of Wuwucun are beginning to buy air conditioners and computers in efforts to raise their standard of living, most are still saving for their children’s education or to move to better places in Shenzhen. 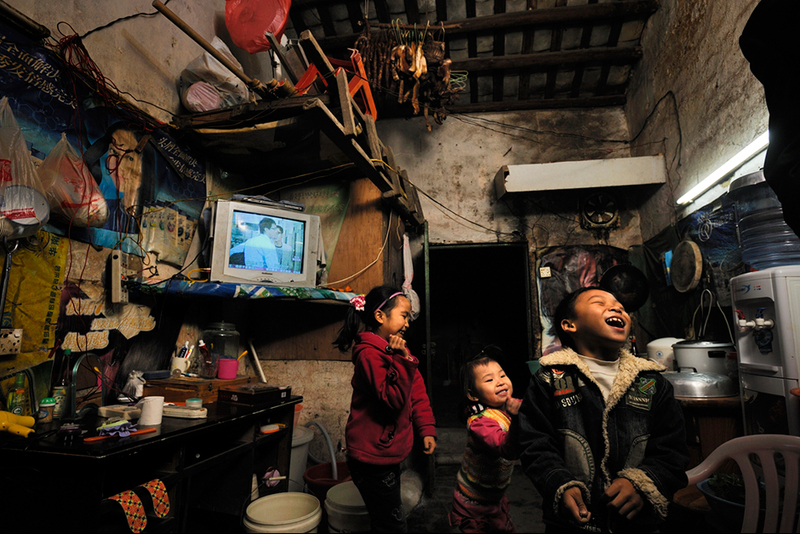 Many of the families have very small television sets, such as this one, showing an Indian soap opera dubbed into Mandarin. 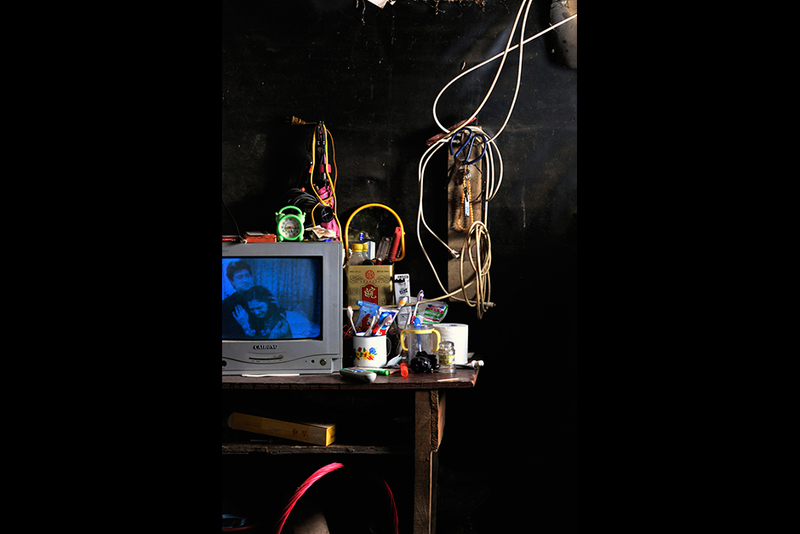 Zhao Neng, right, plays in a neighbor’s home. 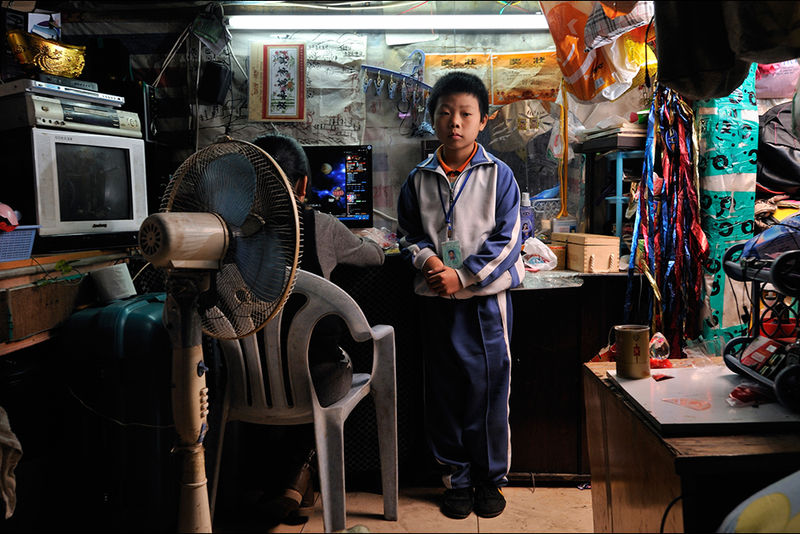 His parents, neither of whom got past middle school, save most of their income to send him and his older sister, Zhao Huan, to school back in more-affordable Chongqing. “Of course I want to buy an apartment,” says Zhao Xiaoyun, Neng’s dad, “but I don’t have enough money.” Instead, his parents hope that Neng will attend college. 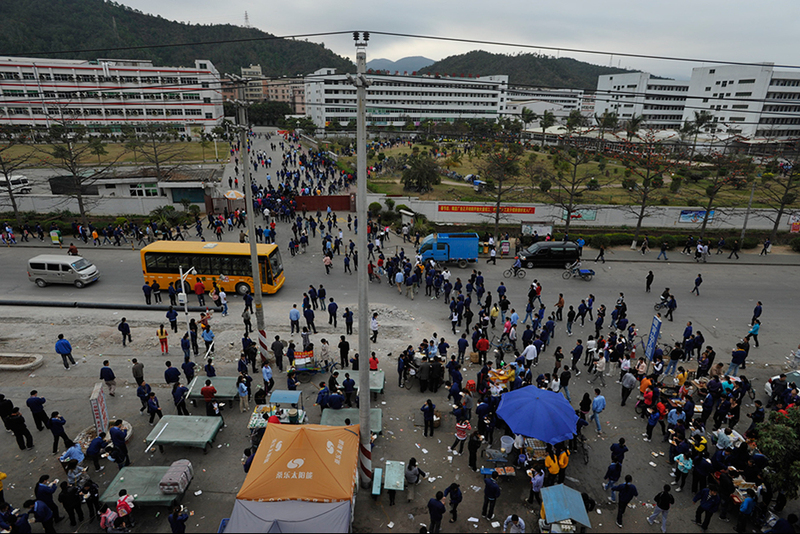 A little after 7 a.m., some of the 18,000 employees arrive for work at the Taiwan-owned Freetrend plant in Longgang. It is the largest manufacturer of New Balance products in the world. Xu Huali, 37, left rural Chongqing in 1991 with a grade school education, eventually moving to Wuwucun in 1999 after getting married with another Chongqing migrant. She has been making shoes for more than a decade, and currently glues soles to uppers for New Balance for 2000 yuan ($320) per month. 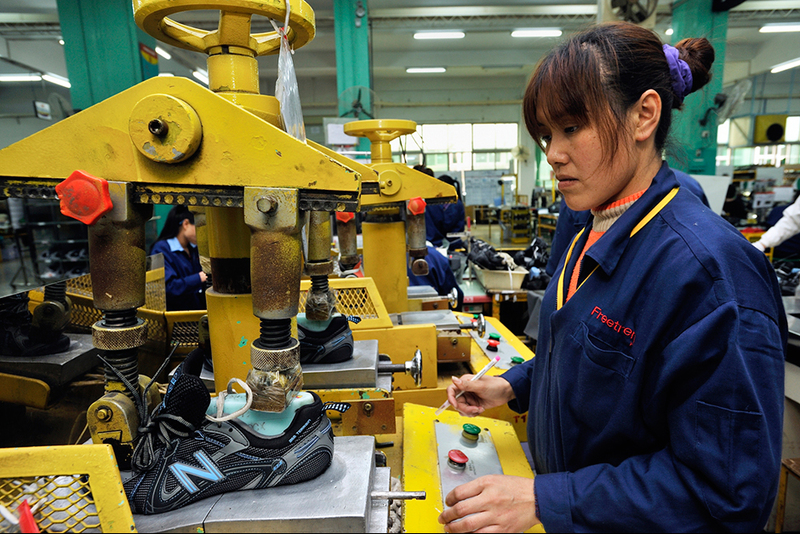 Zhao Meifang’s sister-in-law, Xu Xiaoying, works the factory line at the Freetrend New Balance plant. Wang Qiong started working on the New Balance line two years ago. 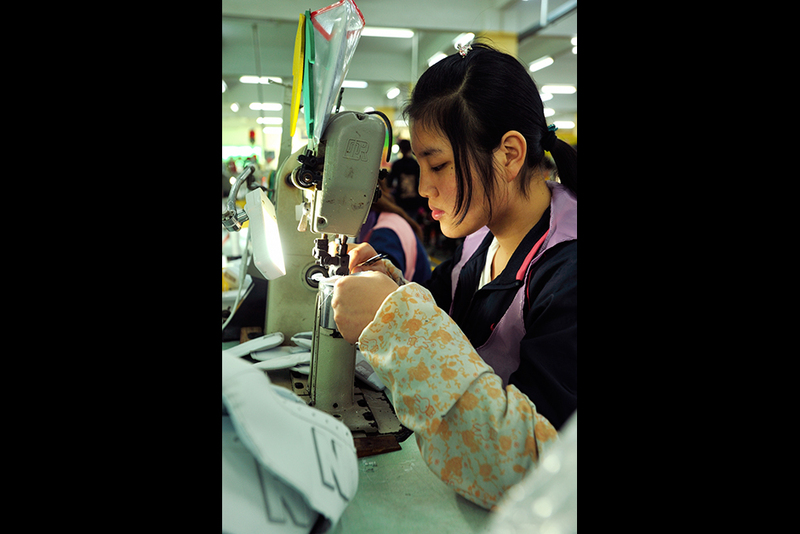 Stitching uppers, she earns about 1,800 yuan ($290) a month and saves nearly half. Previously, she worked at an electronics factory but feels that the sneaker line better develops her marketable skills. Zhao Meifang’s sixteen-year-old daughter, Zhao Xiaomei, and her cousin, Tan Xiao, enjoy city life. 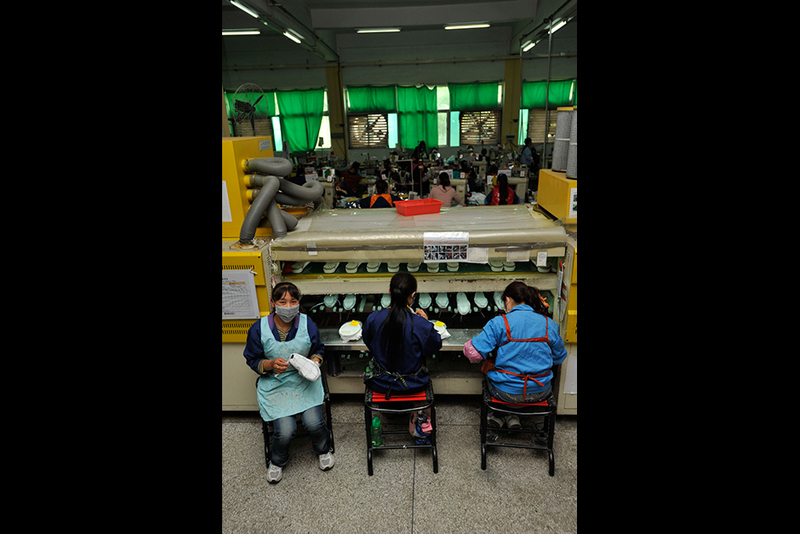 In addition to Xiaomei’s mother, they have a number of other older relatives working at the New Balance factory. Tan Xiao works part-time at a restaurant now but is considering joining them, but Zhao Xiaomei doesn’t want a job at a place with so many family members around. Zhao Xiaomei and her cousin Tan Xiao. 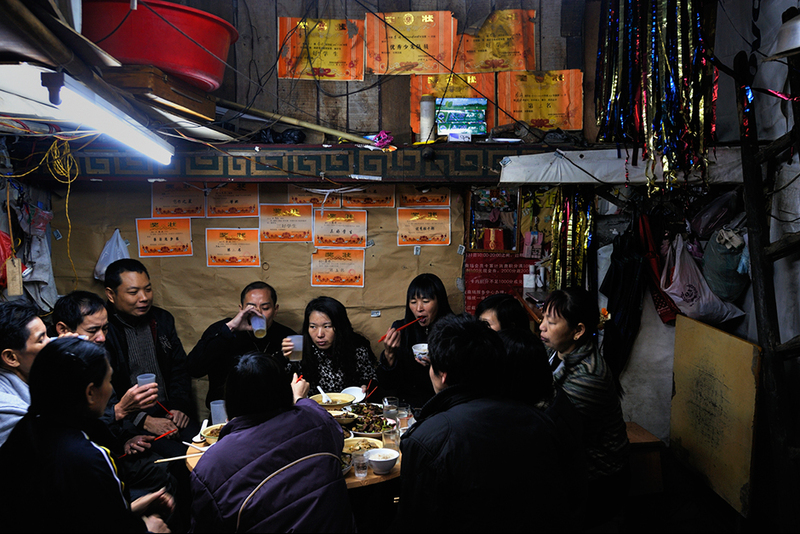 For Chinese New Year, relatives from other parts of Shenzhen and Guangdong come to Wuwucun to visit and have dinner. Wuwucun is quiet in the evening—most everybody goes to sleep by nine o’clock. 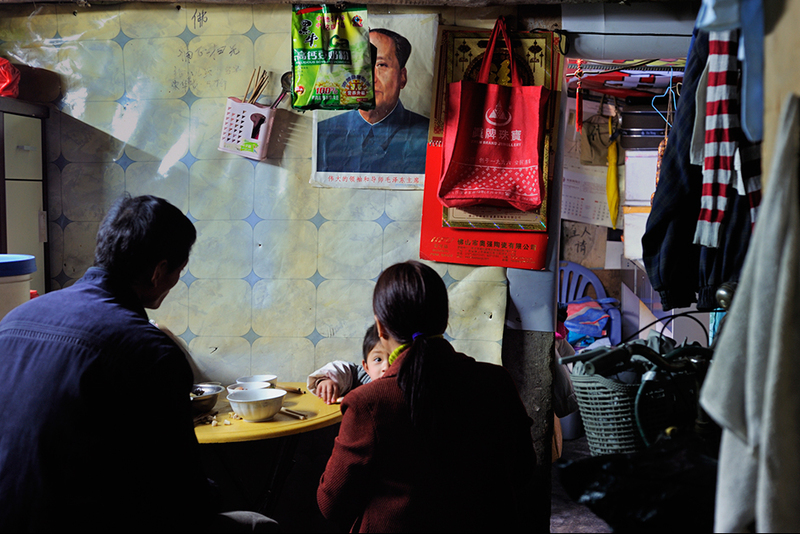 A family eats in their twenty-five-square-meter home. 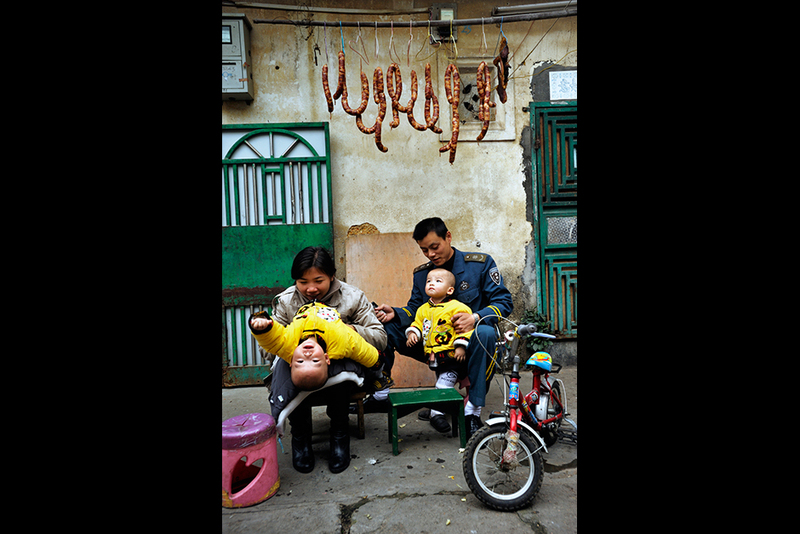 A couple who upgraded to a nearby apartment after having twins return to Wuwucun for a visit. The village homes are tiny—about 270 square feet—and typically house four people. Rent is 150 yuan ($24) a month, about half that of an apartment. Villagers who talk of going back to Chongqing say that it’s mainly because education and housing are pricey in Shenzhen. 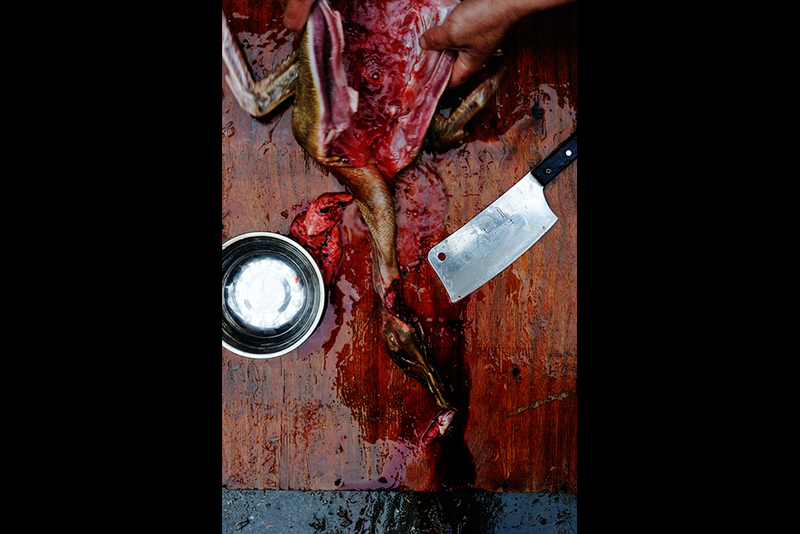 Steady work allows Wuwucun residents to have nicer foods, such as duck. 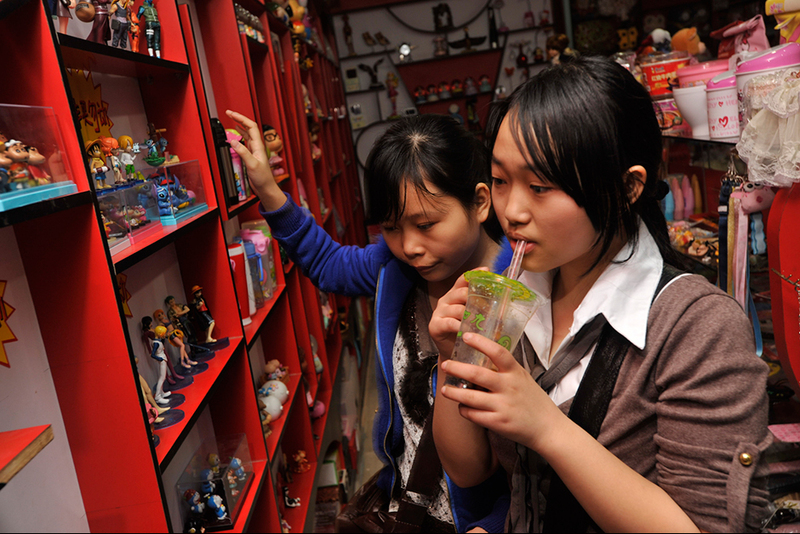 In Wuwucun, children’s parents do not have much extra money to spend on toys. Here a girl uses bits of dried cement to play jacks in the entryway of the multistory apartments next to the village. 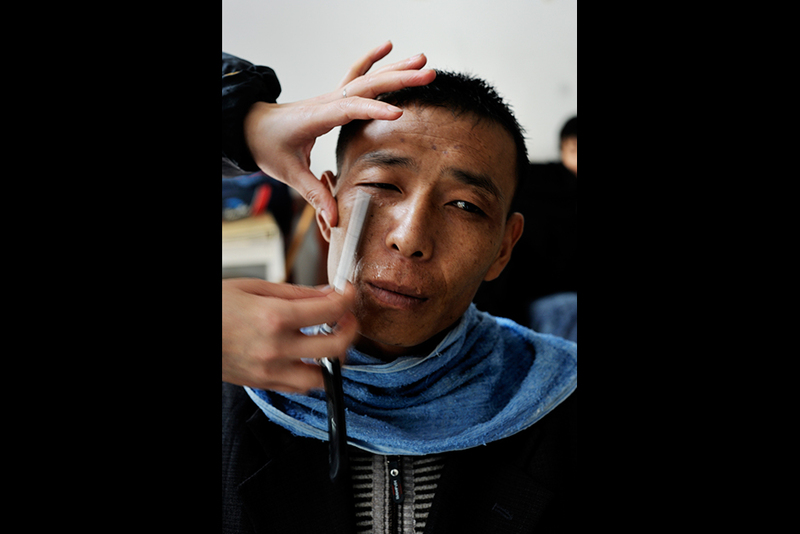 Cutting anything during the Spring Festival is considered unlucky, so a Wuwucun man gets a shave and a haircut a couple of days before. 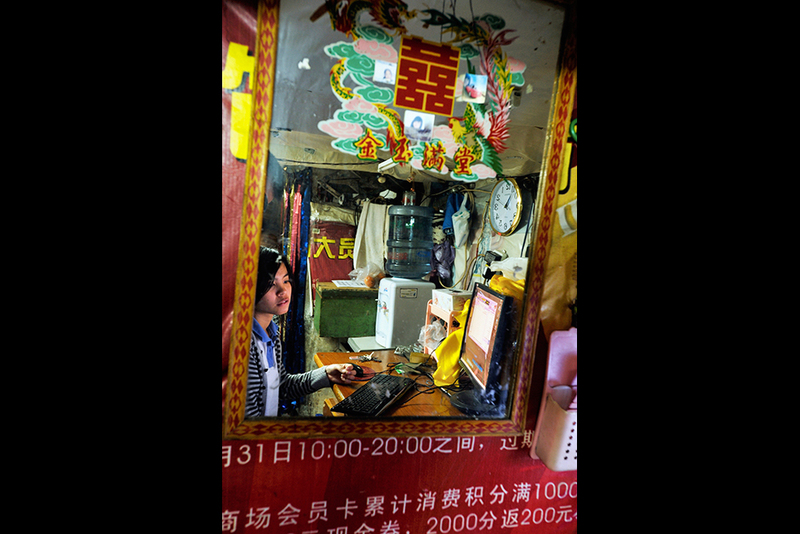 Over the past couple of years, Wuwucun workers have started buying PCs and broadband internet access for their families. The most popular online game among teen girls is QQ Farm, in which they raise and sell virtual crops—a digital imitation of precisely the world their parents left behind. Other recent lifestyle upgrades include air conditioners and satellite TV subscriptions. In Zhao Meifang’s home education is important. Her daughter, Tan Yue (also a shoe worker), bought a computer for the family last year. She hopes her son, Tan Xiao, will go to university. She is trying to save the 20,000 yuan ($3,200) in annual tuition. On the wall are the family’s school awards and certificates. Wuwucun families paper their walls with advertising posters to keep out drafts and smells. 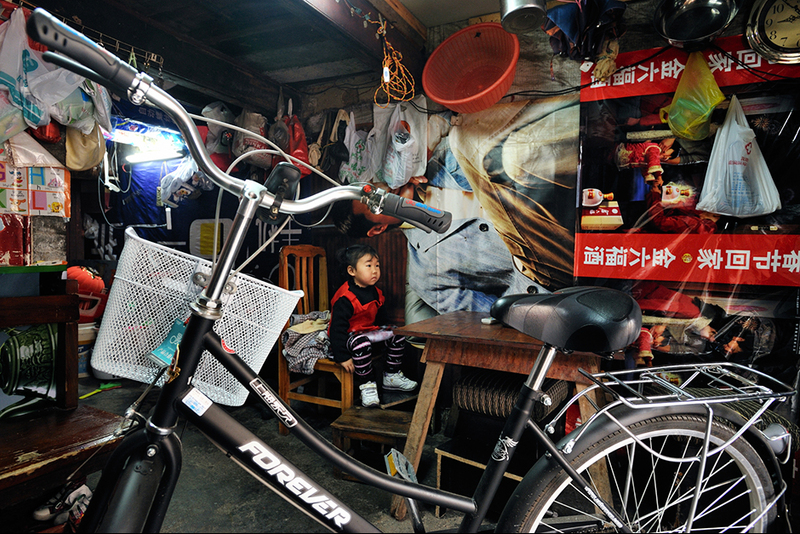 Xu Huali bought a new bicycle for the half-hour ride she takes with several other women to and from the factory. Sundays she parks it in her next-door neighbor’s home because she and her husband don’t have enough space in their smaller home. Because of China’s One-Child Policy, perhaps the greatest benefit offered by steady income is the ability to pay the fines levied after the birth of a second or third child. In 2003, Xu paid 10,000 yuan (then $1,600) after Neng was born. The amount of the fine rises with a family’s income. 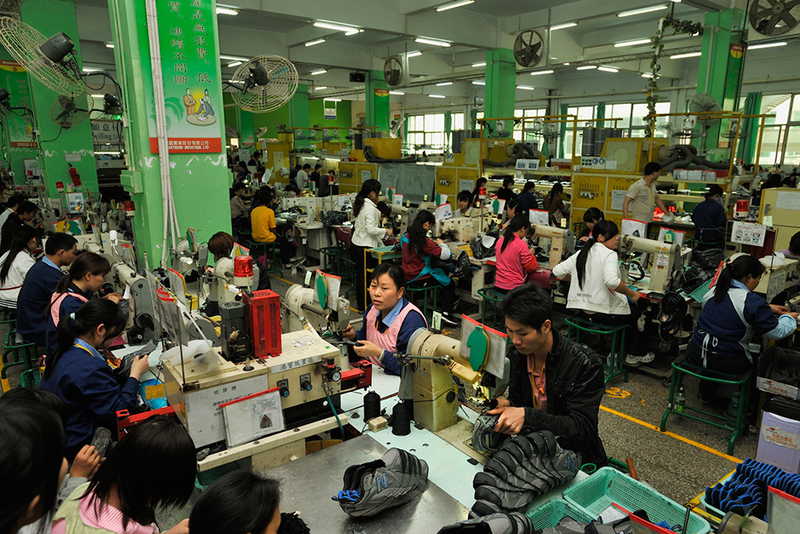 Most Wuwucun families would pay between $1,500 and $3,000, or a year of factory pay. Wearing her holiday best, a girl stands in the doorway of her Wuwucun home. Wuwucun was first settled nearly 200 years ago by a Hakka minority clan surnamed Wu. 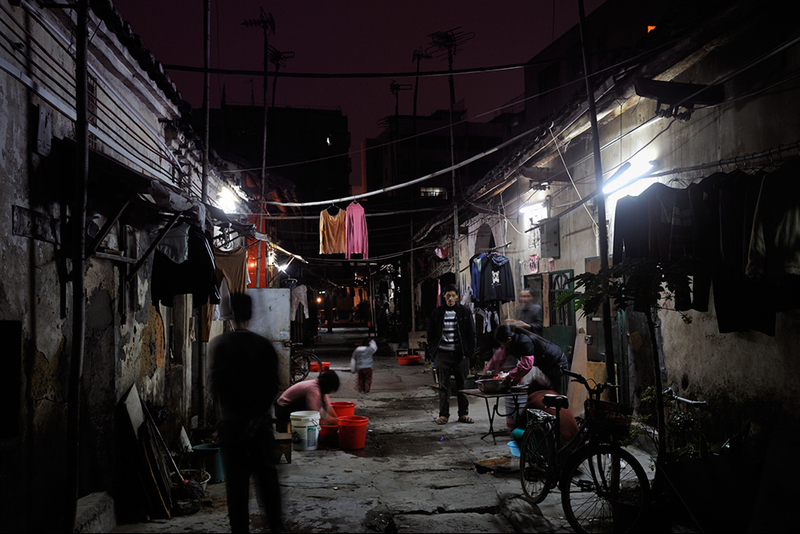 Starting in 1996, the Wus moved to modern apartments, renting their old homes to the Chongqing migrants. 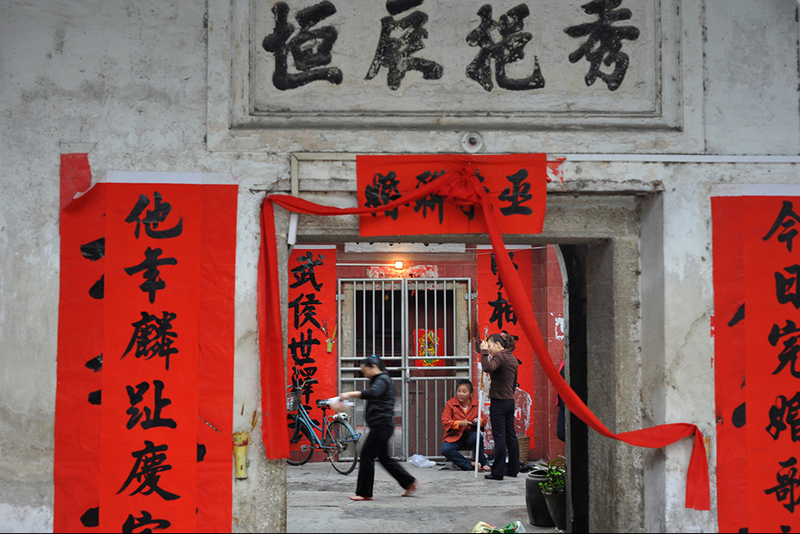 On special occasions like weddings and the Spring Festival, the Wus return to hang red banners on the ancestral gate. Tan Yue, in her holiday outfit. The children of Wuwucun’s migrant workers are now having their own babies, a third Shenzhen generation that has never been to Chongqing or Sichuan. 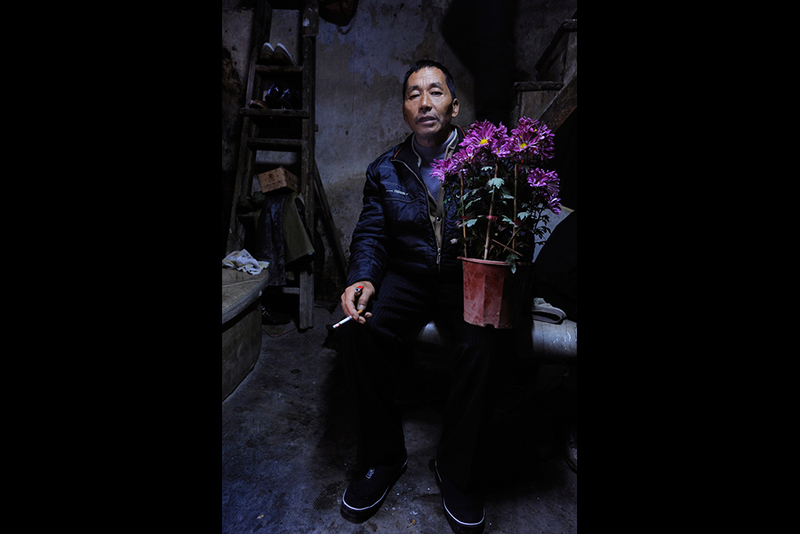 A Wuwucun man shows a pot of flowers he has salvaged from a department store’s discarded holiday decorations. 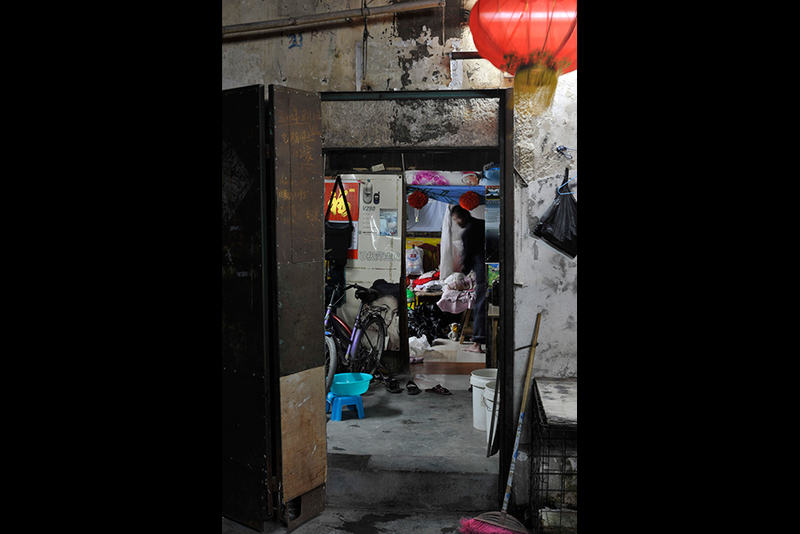 Tucked amidst the factories and shops of of the Longgang district of the southern boomtown of Shenzhen sits a handful of narrow Qing Dynasty lanes collectively called Wuwucun, after the original Hakka minority Wu clan who established the village in the early nineteenth century. If one squints a bit and ignores the satellite dishes on the tiled roofs, the place does not appear to have changed much since then. But the Wus have been gone for a couple of decades now, leaving their ancestral buildings for the modern apartments springing up in the nicer parts of town. Who has taken their place? 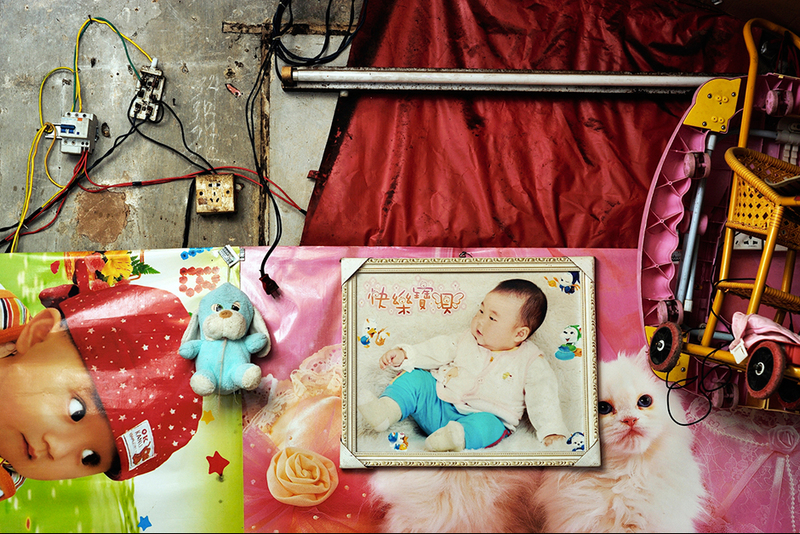 China’s new urban settlers—migrant workers who do not want to migrate anymore. Most people viewing this essay own more than a few things manufactured, at least partially, in Shenzhen. You might even be wearing them or wired into them as you read this. Wuwucun’s primary contribution to the vast heap of consumer goods is sports shoes; currently the village’s biggest employer is a Taiwan-owned factory producing more New Balance sneakers than anywhere else in the world. The stable employment provided by this and other assembly line jobs, especially for women, is the primary reason to stay put. 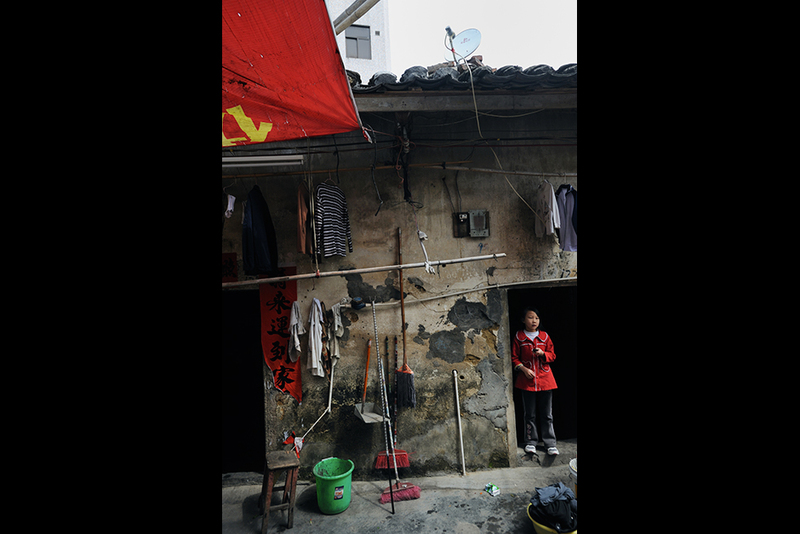 Many of Wuwucun’s tenants have been living there for more than a decade after coming over from rural Chongqing. Some daughters have joined their mothers and aunts gluing soles and stitching uppers, with other children scattered about the service industries and a few planning for university. Everybody is looking for an upgrade. Nobody wants to return to the countryside to plant rice in the hills. 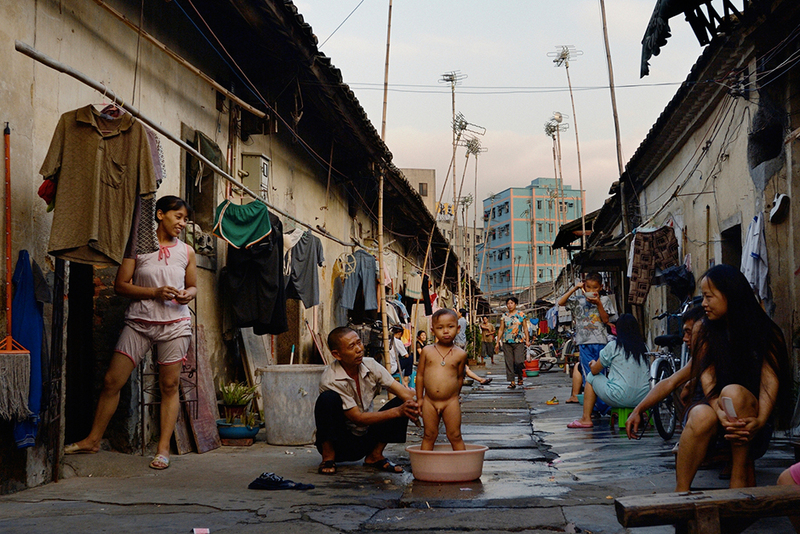 In early 2013, China’s government unveiled a policy to close the rich-poor gap. 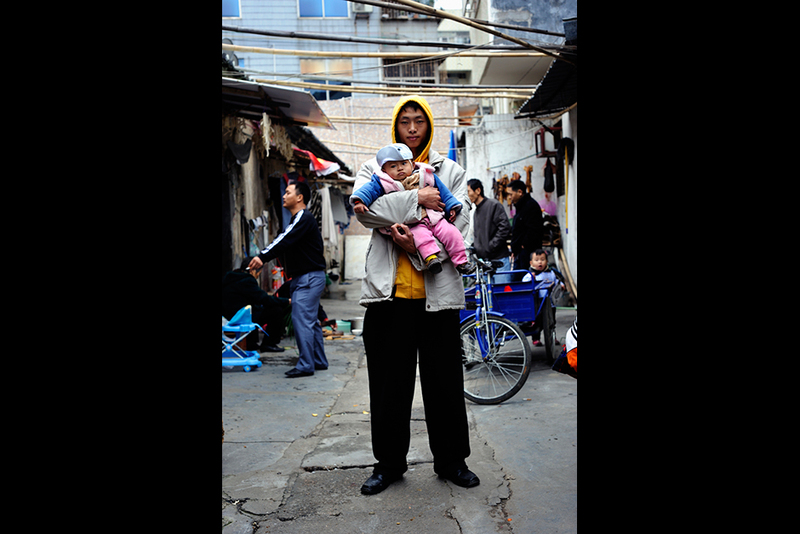 Here in Wuwucun are some of the people these policies are intended to benefit, and this is a small glimpse into their lives.